Swami Jitakamananda | Ramakrishna Math & Mission, Mangaluru. Two days national level conference on “Celebration of 150th birth anniversary of Swami Vivekananda” began on Friday July 11 at Shri Dharmasthala Manjunatheshwara College of Business Management here. Swami Nikhileshwaranandaji, secretary of Ramakrishna Mission, Vadodara inaugurated the conference. “We have got the permission to celebrate Swami Vivekananda’s 150th birth anniversary for four years. So many institutions started celebrating it from 2010. But when I look here, it looks like, the celebration will continue for another year. There are 178 branches of Ramakrishna Matt and still many more branches are coming up. This is all because of Swami Vivekananda’s power,” said Swami Nikhileshwaranandaji in his inaugural speech . “Swami Vivekananda was a true leader. He has done his work for the future generation and to understand his work, we will take more than 1500 years” he added. Swami Nikhileshwaranandaji gave a solution to kill the laziness of everyone with humor. “If you want success in your life, you should kill the laziness which is in you. To kill the laziness you need an AK 47 rifle. AK 47 is nothing but doing exercise in the morning,” he said. “There are five types of long term personality development. One, good physical personality, second, intellectual personality development, third, mental development of personality, fourth, spiritual development and last one is moral development,” he added. ” If you want success in any field, you should have the power of concentration of mind. Many institutions provide excellent education, but they do not provide how the education on a person’s character, how to behave in the society. At present there are human monsters in the society. To find a good person, we have to use the microscope,” he said. Guest of honour Venkatesh Baliga, editor of Kodial Kkabar, Mangalore and alumni of SDMCBM delivered the keynote address on real scope of success comes from spiritual happiness. Chairman of the organizing committee Aruna P Kamath honoured Swami Nikhileshwaranandaji and received the blessings from the Swamiji. Convener Shaini Naveen welcomed the guests. Swami Jitakamananda, secretary of Ramakrishna mission, Mangalore, Dr Padmanabha Marathe and others were present at the occasion. Academic Year – 2014 of Vivekananda Coaching Center at Ramakrishna Mission, Mangalore was inaugurated by Sri Mahabala Marla, Mayor, MCC on 1st June 2014. Swami Jitakamanandaji, Presient, Ramakrishna Math, Mangalore, Sri Premananda Shetty, Opposition Leader, MCC and Prof Raghavendra Prabhu M., Retd Principal, Leadership and HRD college, Mangalore were present on the occasion. Free Uniform, School Bag, Umbrella, Note Book etc were distributed to around 150 needy students. 12 PUC and 8 SSLC Coaching class alumni who had performed well in SSLC and PUC II were felicitated. Ramakrishna Mission Vivekananda Coaching Class is an institution working for the upliftment of needy students. Daily tuition classes are taken for students from 5th to 10th Standard, who dwell in near by slums. Daily they are provided with nutritious food and milk. Also tooth brush, tooth paste, soap, oil etc are given to create awareness about health and hygiene. Regular health check up camps are also conducted for them. Every week classes are taken to impart culture and character. Also many competitions are conducted to bring out the hidden talents in them. 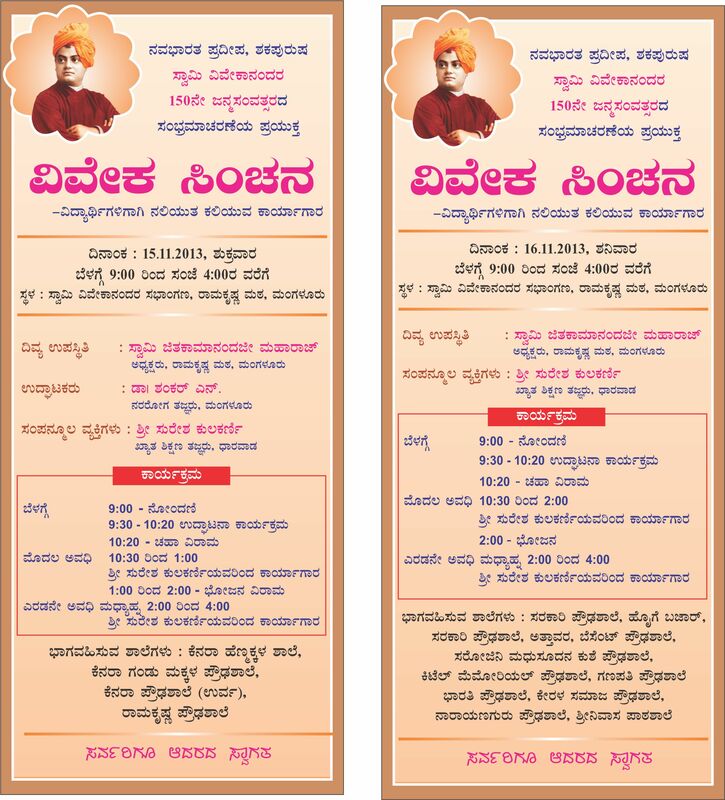 ON THE 12TH OF JAN 2014, NATIONAL YOUTH DAY WAS HELD AT RAMAKRISHNA MATH MANGALORE. NATIONAL YOUTH DAY WAS INAUGURATED AT 9-30 AM BY HON. MINISTER SRI KRISHNA BYRE GOWDA FOLLOWED BY HIS INAUGURAL ADDRESS. ON THE SAME OCCASION A DVD (ON SWAMI VIVEKANANDA’S CHILDHOOD “NARENDRA” ) WAS RELEASED BY DR. VINAY HEGDE, HON CHANCELLOR, NITTE UNIVERSITY. SRI J R LOBO HON. MLA, MANGALORE WAS THE CHIEF GUEST. STUDENTS WERE GIVEN TEA-SNACKS, LUNCH, COMPLIMENTARY BOOKS & CERTIFICATE OF PARTICIPATION. ALL TOGETHER ABOUT 800 STUDENTS PARTICIPATED IN THE PROGRAMME. On the occasion of 150th Birth Anniversary celebrations of Swami Vivekananda we had organised a special programme on 15 th and 16th of November 2011 for the SSLC (Class 10) students. Sri Suresh Kulkarni, Renowned Educationist from Dharwad taught the complete 10th Biology Syllabus in just 3.5 hrs with lots of fun and also Values for life. around 1100 students from more than 16 schools participated in this programme. Students were given tea & snacks, Lunch and complimentary books. The programme organised on 17-09-2013 Tuesday was attended by Degree Students from different colleges of Dakshina Kannada District. The programme was held at Vivekananda Sabhangana, Ramakrishna Math, Mangalore on 16-09-2013 Monday. Post Graduate Students from different colleges of Dakshina Kannada District attended the programme. On this occasion total scholarship of worth Rs 1.25 lac was distributed among 80 meritorious students. We had organised “Viveka Samsmriti : A Tribute to Swami Vivekananda“ from 11th to 17th January 2013 as a part of 150th Birth Anniversary Celebrations of Swami Vivekananda in coordination with Dept. of Youth Services & Sports, Govt. of Karnataka, D.K. District Administration, Swami Vivekananda 150th Janmavarsha Abhiyana Samiti, Mangalore and All India Radio, Mangalore. The programmes were a great success daily attended by thousands of people daily. 11th Viveka Chetana – Youth Programme was attended by around 1000 youths. 12th Viveka Sanchalana – Mega Youth Mela was attended by around 9500 youth. Around 7500 youth partook food on that day. 13th Viveka Vandana – Yakshagana was attended by around 700 people. 14th Viveka Namana – Magic Show was attended by around 700 people. 15th Viveka Chinthana – Value Education Programme for Teachers’ was attended by around 650 Primary School Teachers. 16th Viveka Jagarana – Youth Convention was attended by around 700 youths. 17th Viveka Manthana – Teachers’ Convention was attended by around 650 Primary School teachers. Swami Vivekananda’s influence on the civilization and culture of India and the rest of the world is becoming clearer as days pass by. His thoughts are bound to affect the world positively more and more in the days to come. On this occasion of his 150th Birth Anniversary, we have organised a series of programmes as a tribute to Swami Vivekananda. All are requested to attend the programme and be benefitted by the proceedings.